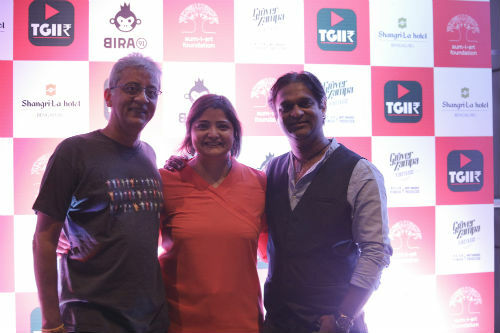 Bangalore: Aum-i-Art Foundation (a non-for-profit music trust) today announced the launch of ‘The Great Indian Indie Recordings’(TGIIR) to revive the Indie music industry. TGIIR is a music app to monetise Independent musicians’ songs and create their own musical genre. The music application is created to inspire the new age musicians and music lovers to upload and listen to a collection of various forms of original music. TGIIR is world’s 1st artist-funding community with a proven Track Record. The music application will credit and transparently compensate composers, recording artists, lyricists & copyright owners for the work they share in the app. The new music application was unveiled by well-known artists and musicians like, Ustad Faiyaz Khan-Chief Guest, President of Karnataka Sangeet Nritya Academy, Arati Rao and Suraj Mani (Founder of the application). The event was also attended by Vasundhra Das, Brodha V, Manoj George (Grammy award winner), Ananth Menon, Khalid and key personalities like Ajith Nambiar (BPL), John Zachariah (HUL), Rini Dutta and others. The evening witnessed enthralling performances by Ustaad Faiyaz Khan, Suraj Mani, Ananth Menon & Bruce Lee Mani amongst others. This unique music app is based on a subscription model. TGIIR invites like-minded music lovers to invest nominal fees of ₹99/- a month to help fund multiple recordings of various Indie Stars. The amount is channeled through Aum-i-art Foundation and 1/3rd of the funds will be used to pay a royalty to all enrolled artists whose music is featured on TGIIR. The funds will also be used to meet the infrastructural and operational expenses of the foundation and to pay artists to record new songs, LIVE before their fans at various venues like OOHeaven. These venues have been equipped with requisite infrastructure. TGIIR will thus create a community of fans who are willing to reward independent artists and who will have a (listenable) track record as proof. The team behind the foundation has been working for the welfare of the artists since 2013. Notably by paying indie artists to produce LIVE performance videos and giving them audio copyrights of the same. They have already funded over 300 independent bands with well over 1500 original songs & recordings. In 2016, the Foundation also built a performance venue OOHeaven where audiences can be invited to fund band recordings and artists who can shoot hi quality videos etc.